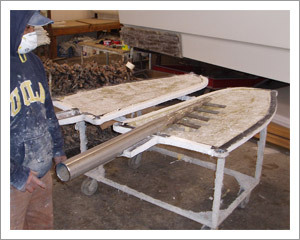 Rudder mold with a tapered stainless steel shaft in position for the foaming process. 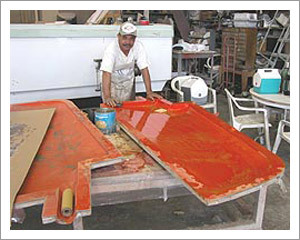 The basic manufacturing process of our rudders has remained unchanged for over 40 years. This time-proven process has yielded strong, reliable and long-lasting rudders. Through the years we have adapted new materials in order to improve strength, durability, and reliability. The closed cell foam core of the rudder remains the same, but the selective addition of unidirectional fibers has increased the strength of our rudders, and the use of Vinylester™ resins has eliminated blisters and the need for expensive barrier coats. 1. 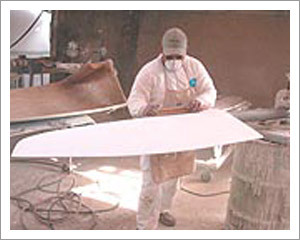 Experienced Finco craftsmen begin the manufacturing process by sanding, polishing and waxing the rudder mold. 2. 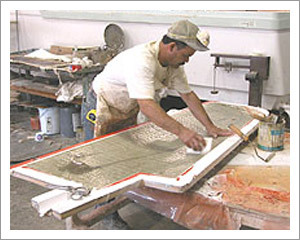 After applying Gelcoat to the mold, they apply a layer of unidirectional fiberglass saturated with Vinylester™ resin. 3. A new rudder shaft is turned from the same material as the original (or stronger.) After it is cut to length and tapered, the tangs are welded into place. 4. 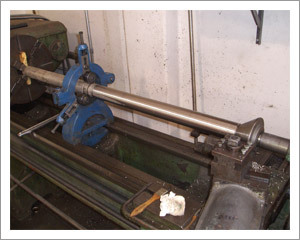 Once the fiberglass has cured, the tapered stainless steel shaft is set into the mold. 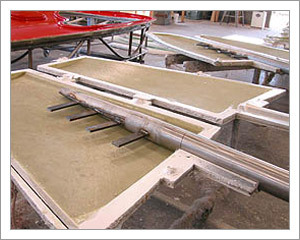 After the shaft is aligned, the halves are mated, clamped and sealed, and liquid foam is poured into the mold. 5. 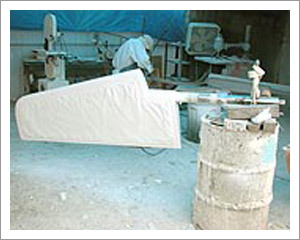 When the foam has cured, the rudder is removed and the seams sanded smooth. 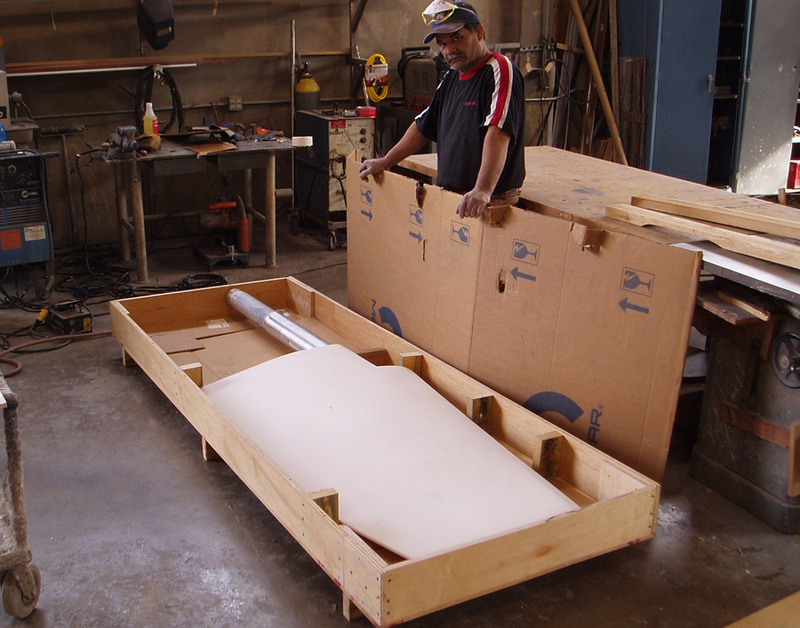 Most OEM rudder fabrication stops here; we go a few steps farther. 6. 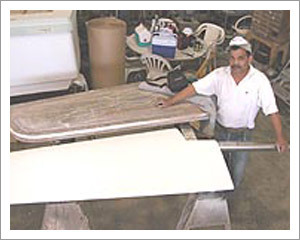 Fiberglass tape is laminated to the seams. After the tape has cured and has been sanded smooth, the rudder gets a final coat of gelcoat. 7. In the last step, the entire rudder is faired and sanded in preparation for you to apply a coat of bottom paint. 8. 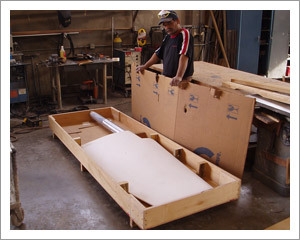 The finished rudder is packed in a purpose-built crate suitable for shipping anywhere in the world. For more information about our line of replacement rudders, please call (714) 973-2878 or contact us at our offices in Santa Ana, California.